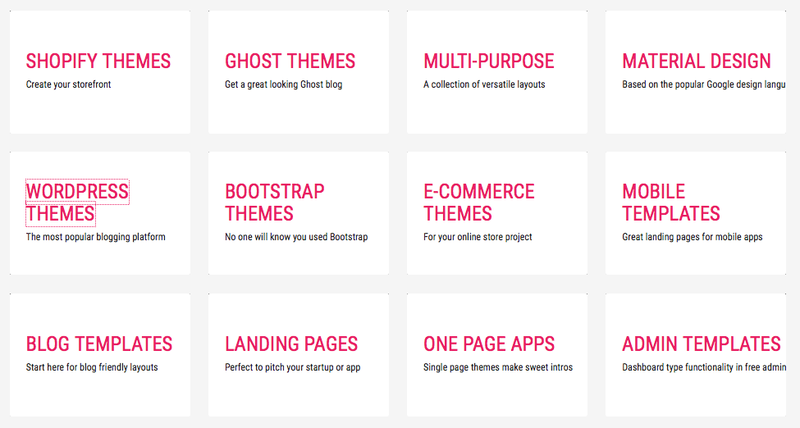 There's a new site that's serious about hand-picked Bootstrap, Material Design, Wordpress, and Ghost themes. But where are the Jekyll themes? Themes are well-organized and categorized with a variety of theme types. It's a curated set of themes. There's not a ton of noise like you'll find on other theme sites. They've done a good job at picking the best looking themes within current design trends and sensibilities. Key template types are covered, like Wordpress, e-Commerce, Bootstrap, Material Design, and even emerging platforms like Ghost. The only criticism I have is that themes specifically built for my favorite static site generator are not present. The generator I'm talking about is Jekyll. GitHub pages has made Jekyll the go-to static site software for the past several years. So why not give Jekyll some love? You've got themes for Ghost, a platform that's solely focused on blogs, so why not include themes specifically for the most well-known static site generator out there? True, Jekyll can use a lot of these themes, like the Bootstrap or Material Design ones, but there are also themes out there that don't need to be hooked onto an existing Jekyll project. You can just fork a repo and your theme is already up and running on a Jekyll site. Luckily, if you're a Jekyll fan like me, there's already a good source for Jekyll-ready themes on jekyllthemes.org. HPSTR is my personal favorite. The author Michael Rose was even nice enough to answer some questions I had setting it up. Another theme called Freelancer is a good example for showing the differences between a pure Bootstrap version of a theme, and a Jekyll version. So even though the Jekyll community is probably happy just sticking to jekyllthemes.org for fast-start themes, I think Theme Stash could really benefit from adding a Jekyll section. I'm guessing there might be a reason and conscious choice to not include Jekyll themes, because I doubt the site's developers would know about Jekyll.